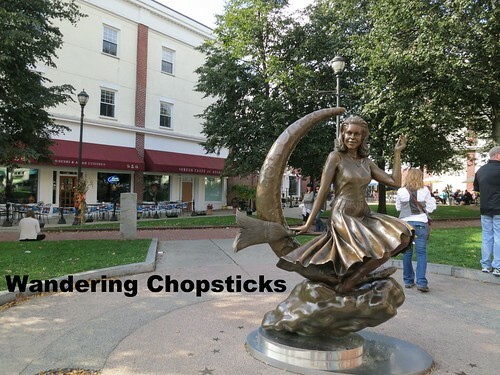 As second-oldest nephew and I walked back from Lobster Shanty - Salem - Massachusetts, we passed by the "Bewitched" statue of Elizabeth Montgomery. There had been a steady line of people all evening, waiting to take pictures with the TV witch, but at this bewitching hour, no one was around. A statue of a fictional witch in a town known for executing real-life "witches"? Tacky and insensitive or kitschy tourist draw? The nine-foot tall bronze statue, which stands at the prominent corner of Essex and Washington Streets, was donated by TV Land cable network in 2005 and was met with controversy before it was erected. 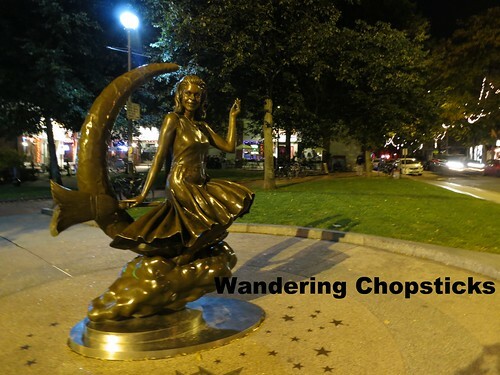 According to an article titled, "'Bewitched' Statue Plan Bothers, Bewilders," by Kathy McCabe in the Boston Globe, Mayor Stanley J. Usovicz Jr. hoped the statue would bring a touch of whimsy and some tourists to Salem. But the city insisted that the statue be placed away from actual 1692 Salem witch trials sites such as Gallows Hill, where 19 people, who were accused of being witches, were hanged. The "Bewitched" connection is that a few episodes were filmed in Salem. There are plenty of other sites around Salem that pay proper respect to this dark period of American history. But, judging from the constant stream of tourists lining up to take pictures with the "Bewitched" statue, I'd say whimsical tourist draw won out. 3 years ago today, A Reunion, a Wedding, a Birthday, and a Michael Jackson Impersonator. 5 years ago today, a Tiramisu and a thank you dinner. 6 years ago today, Part 12 of my "How to Start a Food Blog" series: Measuring Success - Cheerleader or Nerd? 7 years ago today, Uzbekistan - Los Angeles (Closed). Elizabeth Montgomery has always been my favourite actress, and I always loved the show. I have never had the opportunity to see this for myself, so thank you so much for sharing it. Yay! Someone who's excited about "Bewitched" and this post. :P Although, I don't think the statue quite did justice to Elizabeth Montgomery! She's much prettier! She has a lot of fans though! I only managed to get quick shots each time because there was a constant stream of people waiting to take pictures.